How much refueling, in terms of calories, does it take to complete an endurance ride without bonking? While there are rough rules of thumb, answering this question no longer needs to be based on guessing. Power meters make it easy to figure this out: one simple multiplication is all it takes. 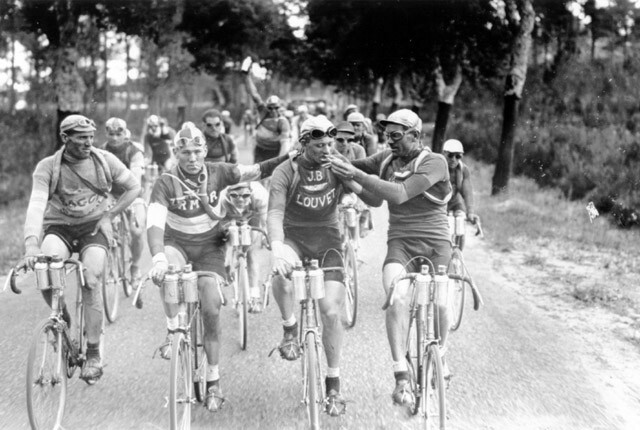 However, it also requires knowing a very important (but ofter neglected) quantity in cycling: the gross efficiency. A cycling power meter measures the mechanical energy per unit time (power) that the cyclist transfers to the chain and to the wheels of the bicycle. However, the combined system of the cyclist+bicycle has a lot more moving parts that need energy to work: the cyclist’s muscles that contract and relax during each pedaling cycle, the legs that move periodically up and down, the heart that pumps blood at a higher rate than normal, etc. The net result is that for every Watt that the cyclist transfers to the bicycle, he/she has to generate many more Watts in order to sustain the required level of cycling. The fraction of the total energy generated by the body that is actually transfered to the bicycle (and is measured by a power meter) is called the gross efficiency of cycling. If a cyclist rides a particular bicycle with a gross efficiency of 25%, then only one out of every four Watts he/she generates actually powers the bicycle. The rest is used for “housekeeping” work and eventually turns into heat. Measuring the gross efficiency of a cyclist in the laboratory requires very elaborate equipment and techniques. Moreover, the gross efficiency depends on a number of factors, such as the position on the bike, the actual power output, the efficiency of pedaling, and the percentage of Type I muscle fibers in the cyclist’s body. And as one might expect, the gross efficiency is higher for cyclists with lower lean leg volume, because it takes them less energy to sustain the up-and-down motion of the legs during a pedaling cycle. For all these reasons, it is not practical for individual cyclists to know their gross efficiency curve. The good news, however, is that for a typical racing bicycle and for a typical cyclists, the value of the cycling efficiency lies in a rather narrow range, between 20% and 24%. And this narrow range allows for a quick and accurate calculation of the caloric requirements during long endurance rides and races, as I will explain below. As an example, if we ride at 150 Watts for 60 minutes, we spend 0.064*150*60=574 Calories. At a much higher effort, say 250 Watts, we spend 0.064*250*60=945 Calories for each hour of riding. We can also use this formula to appreciate the massive caloric requirements of a grueling multi-stage race like the Tour de France. 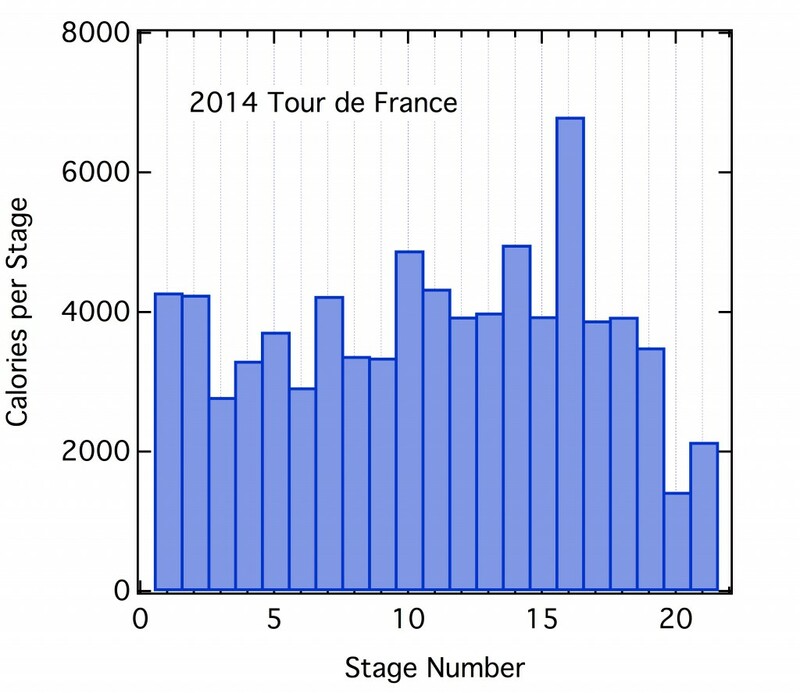 Trainingpeaks.com has compiled the power data for a number of athletes (including Michael Rogers of the team Tinkoff-Saxo) during all the stages of the 2014 Tour de France. The following graph shows the calories used in each stage, calculated using the formula above, assuming an efficiency of 24%. Can you guess which stage Michael Rogers won? Each athlete consumes 3000-5000 calories per stage, for a staggering total of 80,000 calories during the 21 stages of the tour. Adding about 2000 calories per day that each person needs for normal activities (breathing, walking, resting, sleeping, etc), the total amount adds up to more than 120,000 calories, or about 6000 calories per day. To consume this amount of calories, one needs to eat 440 scrambled eggs, 180 portions of pasta, and 47 steaks all together in the 21 riding days of the tour. It just makes you wonder which part of the day is the hardest: riding the stage or fueling for it? Even if you are not riding the Tour but are doing an endurance race, you can use this formula together with your average power you read from your power meter to calculate exactly what it takes to fuel your ride.